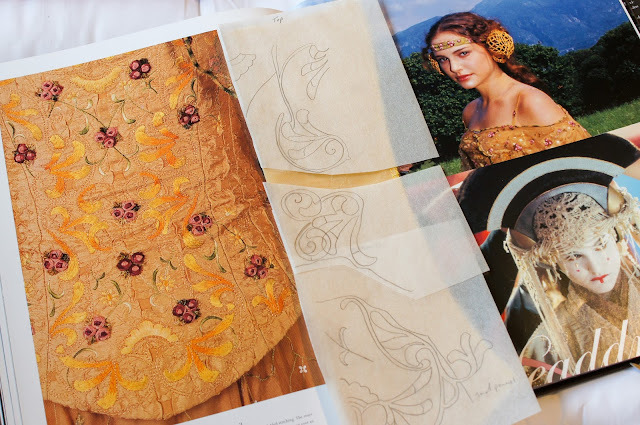 I don't have a lot to share what I've been doing for Padme's Picnic Dress, or Project P19, at the moment because most of what I've done so far is embroidery, but I wanted to post about what I have done so far. 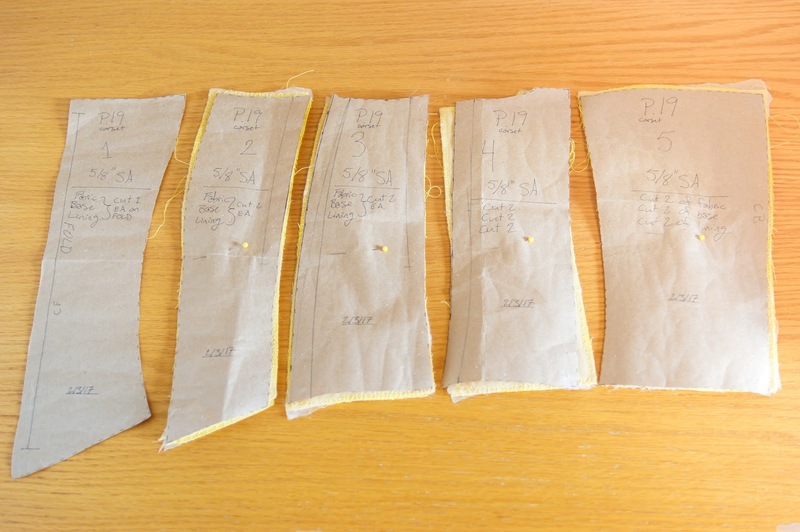 I finished drafting the bodice on my sewing form (sorry, I forgot to take pictures of that) and patterned it a few weeks ago. It's a pretty simple design, consisting of a total of 9 panels. 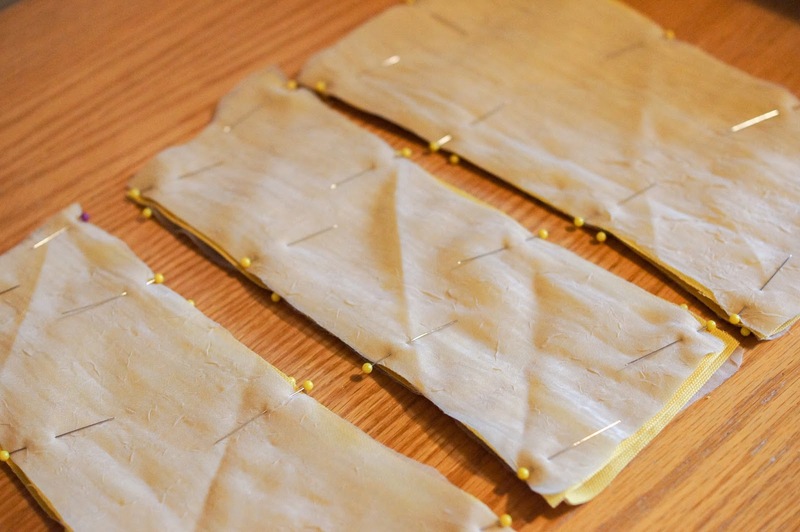 I cut my pattern pieces of 2 layers; canvas for the structured layer and a crinkled nylon chiffon for the top layer. 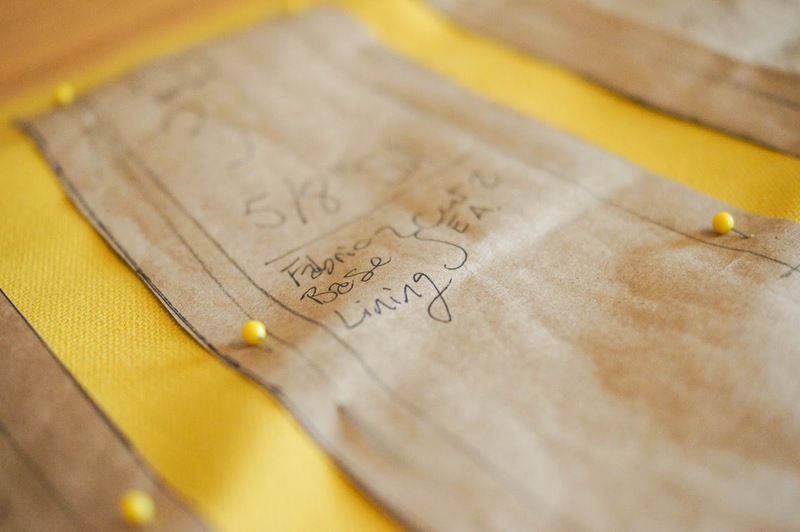 I will also be cutting these same pieces out of my lining fabric, but I don't have any on hand at the moment. Once all my pieces were cut I flatlined the top layer to the canvas by surging around the edges. This was a little tricky with the chiffon since it's so light weight, but I was able to get it done fairly well considering I've never really worked with sheer fabrics before. The next step was figuring out the embroidery pattern. 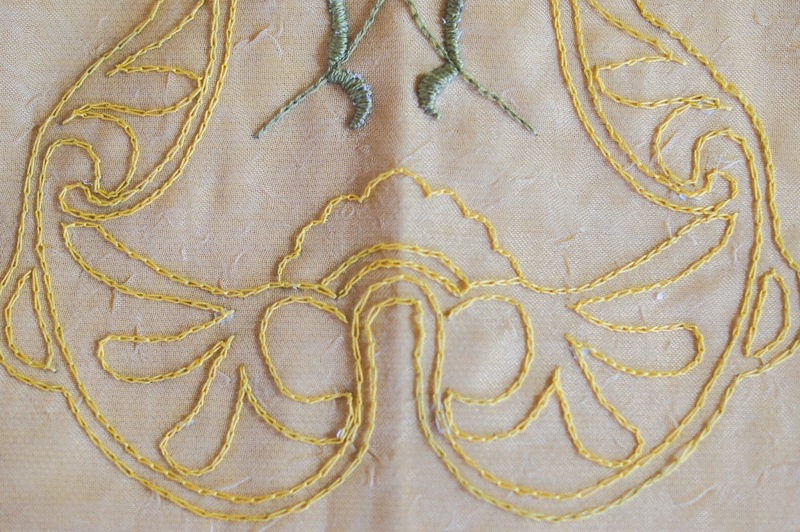 Only two of the panels have embroidery on them; the center front piece and the two on either side have just a little bit of embroidery. 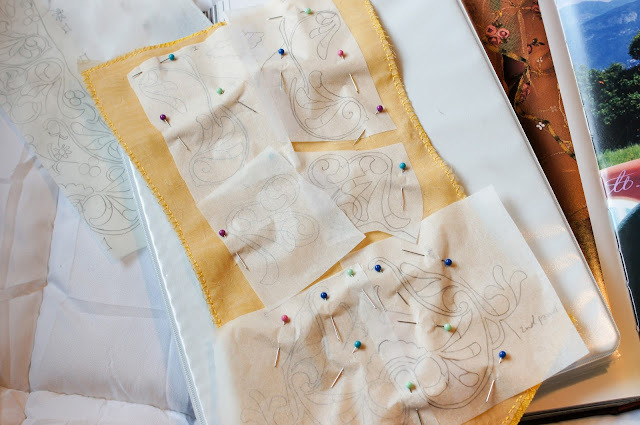 Figuring out the embroidery and turning it into a pattern I could use was a little bit of a challenge. 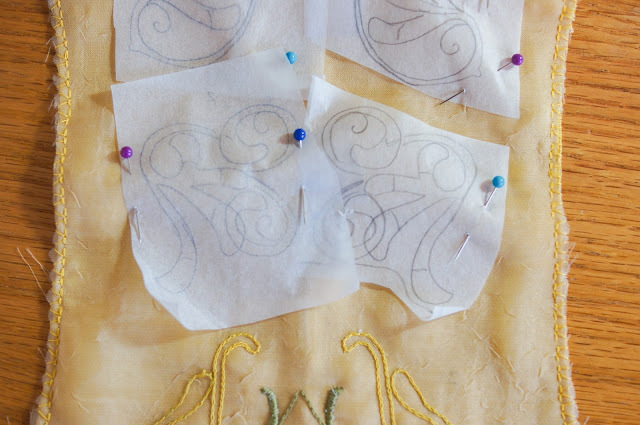 I was originally planning on drawing the pattern onto paper then somehow mirror it and transfer it to the bodice, but I quickly realized that that was going to be really difficult. 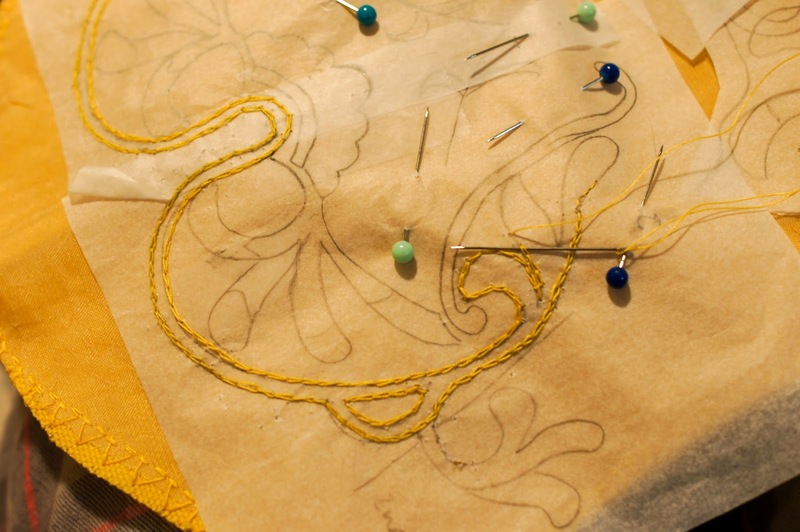 I pulled out Dressing A Galaxy and some tracing paper and started tracing the main embroidery. 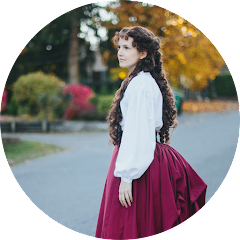 I simplified the pattern because there's a lot going on on that bodice and was able to use that for my pattern. Once I had my simplified version traced I cut it into 3 different sections and spread it over my bodice to get an idea of the size. Luckily the size of the photo in the book is pretty close to my bodice piece and I was able to use my tracings for my pattern. This book. It's kind of amazing. As soon as I knew that this would work I copied the pattern to a second piece of tracing paper and made copies that I could use to mirror the pattern, which I then pinned to the center bodice piece. And then it was time to start embroidering! Here's the part that I'm currently still working on. 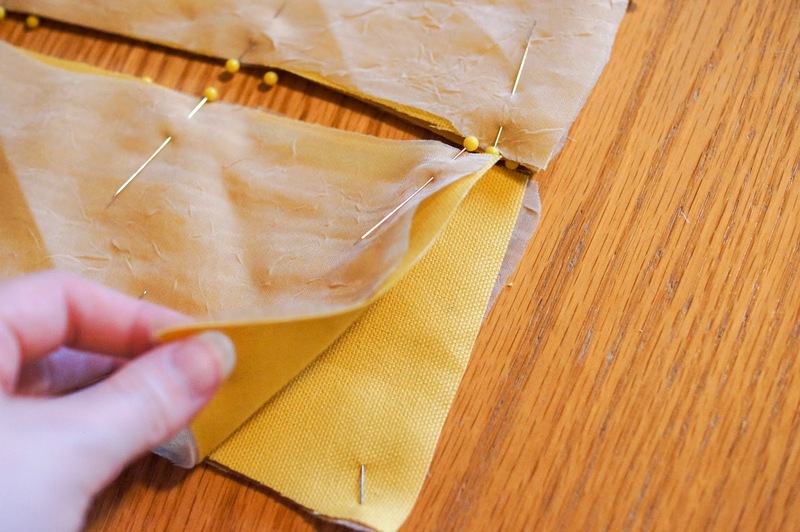 I've started by working the outlining stitching. While examining reference photo's I saw that the outline stitching appeared to be very small chain stitches from a very thin thread. 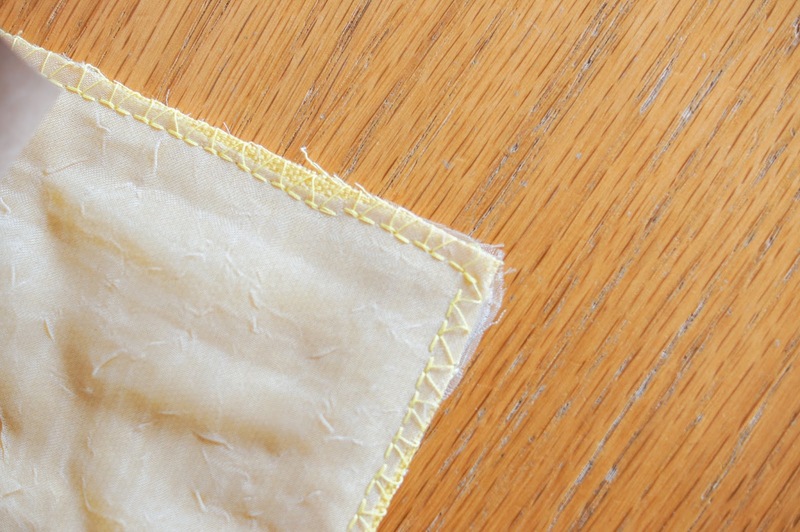 I opted to use normal sewing thread for this part instead of using embroidery thread and I really like the way it looks. My stitching could stand to be a little smaller (okay, maybe a lot smaller) but considering I don't know that much about embroidery I'm happy with it. Once I was done with the first phase of embroidery on the bottom section I tore away the tracing paper and voila! Pretty embroidery! There's still a lot more to do in this section, but tearing away the tissue paper and getting a glimpse of what it will look like is really satisfying. And that's pretty much where I'm at right now. I've alway's loved Episode II and Padme's costumes. It's so hard to choose a favorite, but this one is gorgeous. You have a really good start! I like your embroidery a lot and the depth of research you put into it. I can't wait to see how this turns out. Thank you so much! I love pretty much all of Padme's costumes too, but this one is definitely in my top 3.